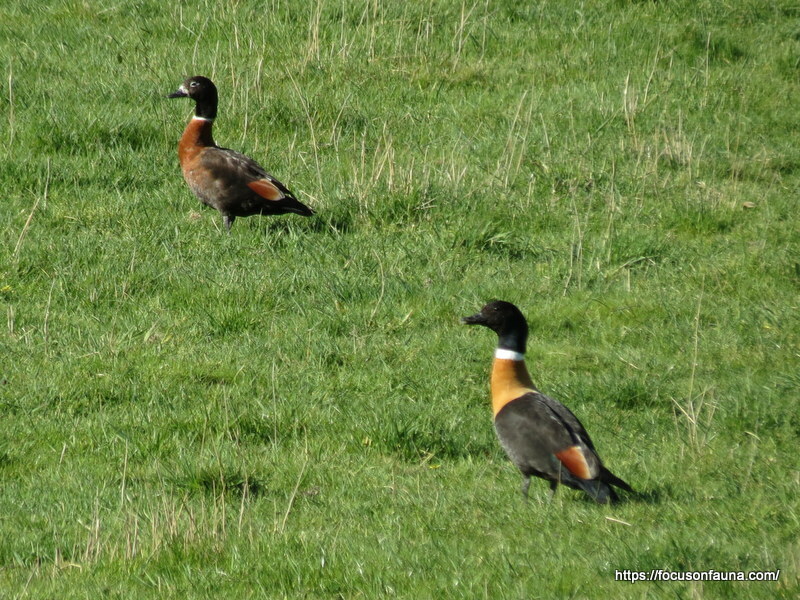 We spotted this handsome pair of ducks, pictured below, in a Strath Creek paddock this week. The following day there were six in the same area – three pairs that were squabbling and honking a bit, but were too far off to photograph. They are Australian Shelducks, still widely known as Mountain Ducks, although that seems to be a misnomer for a species that is found in lowland pastures and lakes. But perhaps no more of a misnomer than “shelduck”, which, according to Fraser and Gray’s Australian Bird Names, is from the obsolete English word “sheld” meaning pied. This refers to the European member of the shelduck genus Tadorna, which is primarily black and white. An earlier form of the common name for the genus was “Sheldrake”, which may have ruffled the feathers of a few feminist ducks! The same source attempts to shed some light on the name Mountain Duck. Apparently the term was used by early colonists of the Swan River and referred to “over the mountains” – the Darling Range presumably? 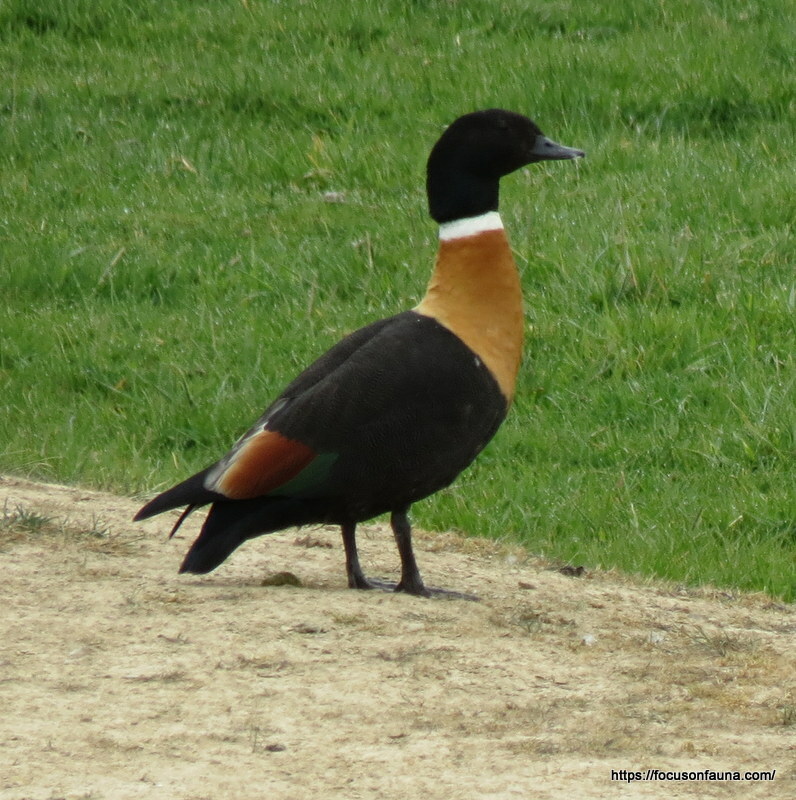 Not sure we’re any the wiser, so perhaps we’ll stick with the official term Shelduck. 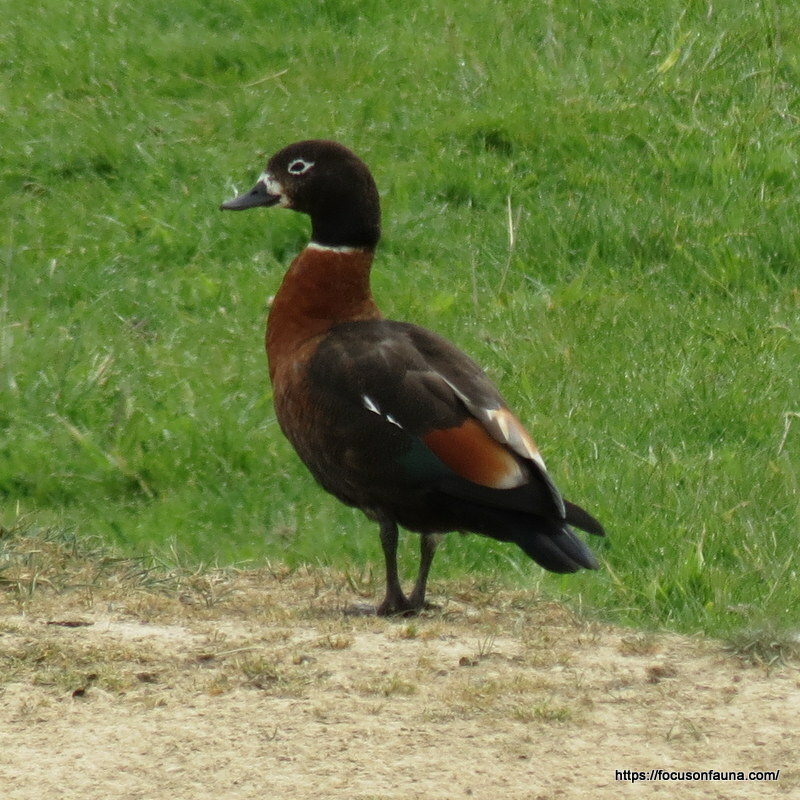 The Australian part of the current moniker came about because it is the only endemic shelduck in Australia, and the name supersedes the former Chestnut-breasted Shelduck. So many confusing names!! The shelducks’ distinctive calls can be heard by clicking on the audio bar below. This was recorded locally, and comprises mainly the female’s honks, but the male’s deeper response can be heard faintly in the background. ← What’s all this carryin’ on?